Canopies of tropical and mountain rainforests. 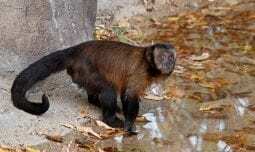 This species ranges through northern South America, specifically Venezuela, Brazil, Guyana, Suriname and French Guiana. Capuchins are the most intelligent New World monkeys – perhaps as intelligent as chimpanzees. They are noted for their ability to fashion and use tools. For instance, they have been observed using rocks to crack open nuts. Hooded capuchins have a semi-prehensile tail that they can use to grip objects. They have opposable thumbs and big toes on their hands and feet further enabling them to easily manipulate objects. They use their prehensile tail to anchor themselves when climbing around in the trees and to keep them from falling when they sleep. Unlike some monkeys with prehensile tails, capuchins cannot hang by their tail alone. Although they normally walk on all fours, for short distances capuchins are often observed walking on two legs. This upright posture enables the monkeys to carry and manipulate food or other objects as they move through the forest. Hooded capuchins are 12-22 inches (30-56 cm) long with a 15-22 inch (38-56 cm) tail. Adults weigh six to eight pounds (3-4 kg). Their fur is light to dark brown with a distinctive black cap on the head. Hooded capuchins have tufts of hair that form ridges along the side of the top of their head. In the wild: Fruit, flowers, leaves, insects, birds, eggs, lizards, and small mammals. At the zoo: Monkey chow, fruits, vegetables, seeds, nuts, and eggs. Jaguars and large birds of prey consume the hooded capuchin. Capuchins are very social animals living in groups of six to 30 individuals. These groups consist of related females and their offspring along with several males. There is usually one dominant male who has primary rights to mate with females in the group. Females reach maturity at about four years of age, males at about seven to eight years of age. Females bear young every two years following a gestation of 160-180 days. Single births are more common, twins are rare. For the first weeks the helpless newborns cling to their mother’s back with arms, legs and tail. Young capuchins can get around on their own at six months but often maintain tail contact with their mother when exploring. They are weaned by one year. Life expectancy in the wild is up to 25 years and they can live over 40 years in captivity. The hooded capuchin has the most dexterous hands of any New World monkey. 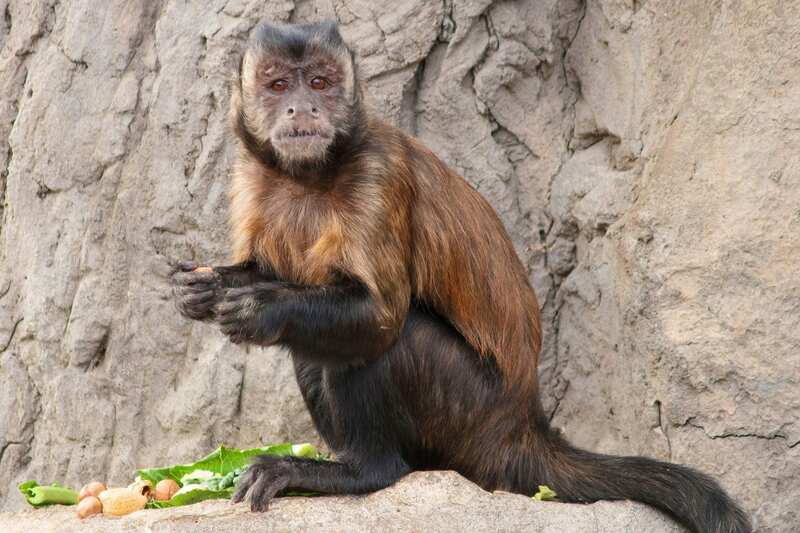 Capuchin monkeys are named for the cap of dark fur on the top of their heads that resembles a Monk’s hood or “capuche”. Except for a midday nap, capuchins spend their entire day searching for food. 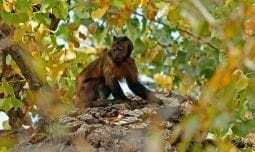 Hooded capuchins are threatened by habitat loss and hunting, however due to this species’ high reproductive potential and its habitat flexibility, populations have not been as devastated as other primates under similar circumstances.